For this series of prints, I strap a desktop scanner, laptop and custom-made battery pack to my body, and perform images into existence. The dynamism of my relationship to the landscape is transformed into beautiful and quirky renderings, which are re-stretched and colored on my laptop, then produced as archival art objects using digital or traditional processes. "The work that remained with me long after I had left the gallery space, however, was Epics and Anthologies... derived from scans of Stern's bookshelf... their spines stretched and compressed to the point of illegibility, the books become like blocks in a warped Tetris game, the layers of creative history piling up so quickly and disjointedly that one is powerless to effectively decode their meanings and implications...."
"Stern's performative interests expand to include ‘performing' a relationship to history, a quietly anarchic deconstruction of the creative person's position in relation to history.... [the works] reveal that Stern's is a position of productive paradox, of signalling his debt to the historical archive of creativity yet resisting the impulse to politely replicate its terms." Compressionism is a digital performance and analog archive, where I strap a desktop scanner, laptop and custom-made battery pack to my body, and perform images into existence. 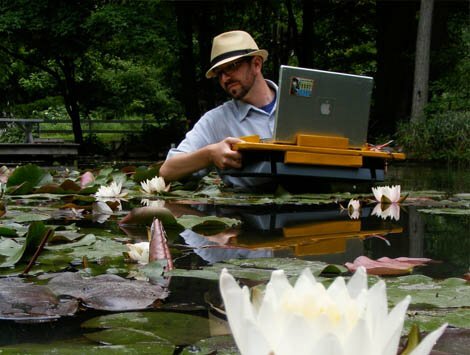 I might scan in straight, long lines across tables, tie the scanner around my neck and swing over flowers, do pogo-like gestures over bricks, or just follow the wind over water lilies in a pond. The dynamism of my relationship to the landscape is transformed into beautiful and quirky renderings, which are re-stretched and colored on my laptop, then produced as archival art objects using photographic or inkjet processes. I also often take details from these images and iteratively re-make them as traditional prints: lithographs, etchings, engravings and woodcuts, among others. Compressionism follows the trajectory of Impressionist painting, through Surrealism to Postmodernism, but rather than citing crises of representation, reality or simulation, my focus is on performing all three in relation to each other.